We built the pool, now let's jump in! Last year we read, this year we will swim! We are swimming laps for Dr. Hall's Art Cart. Samantha and I are joining forces and hope to make Dr. Hall and Mrs. Susie proud. We hope you will join our swim this year and help us raise enough money to fill a swimming pool full of art supplies! The children at Mary Bridge will be so excited to create an art project and begin their healing process. Thank you so much for helping us with our journey to give back to Mary Bridge and Dr. Hall. Without all of you, our fundraiser would not be a success. We will find the pool, we will swim the laps, you just need to sponsor us for each lap we swim! 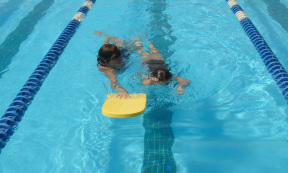 We will let you know how many laps we swim and then you may do your part by sending a check written to Mary Bridge Children's Foundation to our address. Thank you so much for your support. Now, let's dive in! How many laps did we swim? Payton is swimming for gold- paint, crayons, glitter and anything sparkly! Hi everyone! As most of you know, I decided to have another fundraiser this summer to raise funds for the Hall's Art for Heart Fund at Mary Bridge Children's Hospital. This fund means so much to me and my family. It was started by my heart surgeon and his family and it provides activities for children like myself to do while they are in the hospital. Last year with my read-a-thon and with your help, I raised $1500 for the fund. This year I pray that we will raise even more. Samantha and I decided to work as a team this year and swim laps to raise the money. 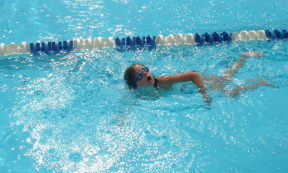 Many of you have already sent us a note stating that you would sponsor us $1 per lap during our swim-a-thon this week. 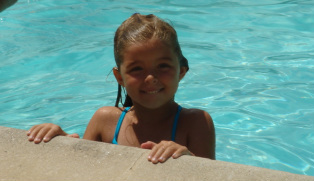 Well, due to poor weather here in Texas and back to school activities, we were only able to swim one day. Our goal was 30 laps, but we were planning on swimming the entire week. So today was our day and guess what, Mama and Daddy had to stop us at 36 laps!!!! Samantha completed 12 laps (with a little assistance from Mama) and I swam 24 all by myself. Mama and Daddy could not believe it! We took a break and went down the slides at the pool for a little while, but then we went back to business. So, even though we only had one day, we swam 36 laps (Mama had no idea we could swim so many!) It just shows how motivated I am to raise as much as possible for the hospital. So, I know it was more than you expected, but any donation you would make to the hospital would be greatly appreciated. And remember, it is tax deductible- just write a check to Mary Bridge Children's Foundation, but send it to me and I will see that the hospital puts it in Dr. Hall's fund. Thanks again for your continued support and prayers! Oh, and please feel free to forward this along to anyone else that may like to support a good cause. Samantha is a little fish! Samantha swims hard to the finish line so the kids can cut out fish of all colors. Okay, our parents have always told us to reach for the sky and we would be able to accomplish anything, but after this year's fundraiser, we truly see that anything is possible. We feel like we are on cloud nine (not really sure what that means, but it is a part of the sky, right? Because of all of your generosity, we are making a donation to Hall's Art for Heart Endowment Fund at Mary Bridge in the amount of $2,500!!!! This is $1,000 more than we raised last year- wow!!! Swimming laps was hard work, but it was worth the effort. Our entire family is overwhelmed with the kindness that all of you have shown us. This year, we not only reached out to those who have been supporting me throughout this journey, but also to our new friends that have come into our lives. Our fundraiser this year reached 41 families in 11 different states and Argentina!! Thank you all for your love and support. 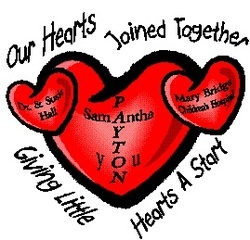 Please keep praying for my heart to stay healthy and for Samantha to continue her healthy journey through life. We hope you enjoy our bookmark this year as a reminder of what a wonderful doctor and hospital you've supported. Look out Samantha, here I come!